Your miniSpinner will not be totally silent, but there are a couple of things that can make it noisier than it should be. Most of them are flyer related. It usually helps to run your miniSpinner VERY slowly and observe what is happening and to identify the source of the noise. 1. Thumping noise once per revolution, even at very low speed: On HansenCrafts flyers, the stationary yarn guide may strike the drive band if it is perpendicular to the wooden flyer crossarm. It’s very easy to see if you turn the flyer by hand or run your miniSpinner VERY slowly and observe what happens when the yarn guide passes by the drive band. Simply twist the yarn guide so it clears the drive band. If the yarn guide will not stay in the correct position, remove it, put some Super Glue or epoxy glue into the hole, and install the yarn guide. 2. Knocking noise once per revolution, even at very low speed: Flyer is "walking out" of the ball bearing. 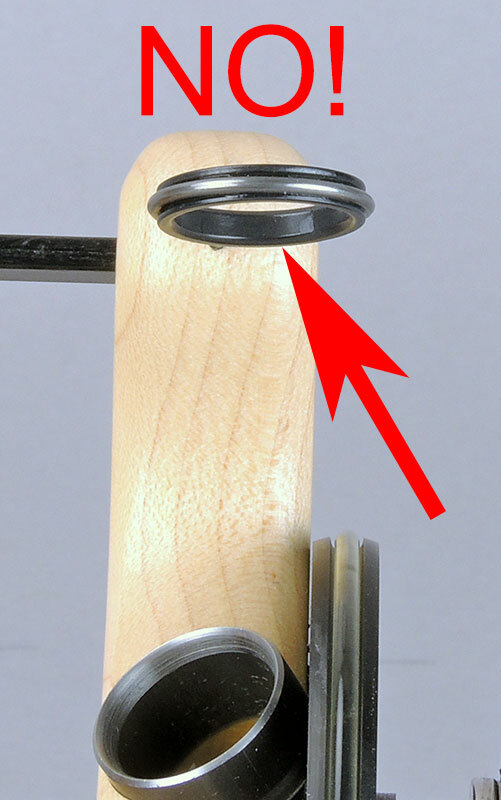 The flyer walks out of the ball bearing, then the magnet pulls it back, causing a sharp knocking noise. Remove the flyer, smear a little Super Lube grease around the outside of the orifice tube where it goes into the ball bearing, and reinstall the flyer. This prevents the flyer from gaining enough traction to walk out, and resolves the problem. 3. Entire miniSpinner vibrates; out of balance: Slight out-of-balance vibration is normal, because it isn’t possible to perfectly balance flyers with moving yarn guides. Be sure your miniSpinner isn’t missing a foot, this can cause it to rock back-and-forth. Do not remove the unused sliding yarn guide from your flyer; it will make it unbalanced. If both yarn guides are present, the unused one can be moved to find the best balance; the center of the arm is usually best but may vary a little from one flyer to the next. Once you find the best location, you can usually leave it there; you do not need to move it to match the other yarn guide. 4. 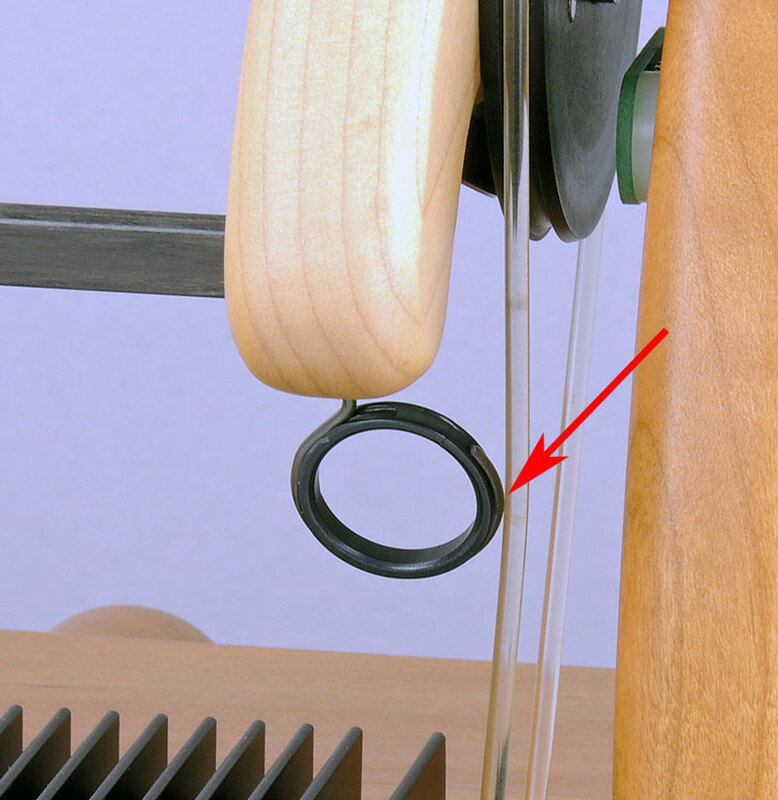 General knocking or clacking noises not once/revolution: Lack of bobbin endplay or excessive endplay. The bobbin should have around 1/16" (1.5mm) of endplay, or a little more. 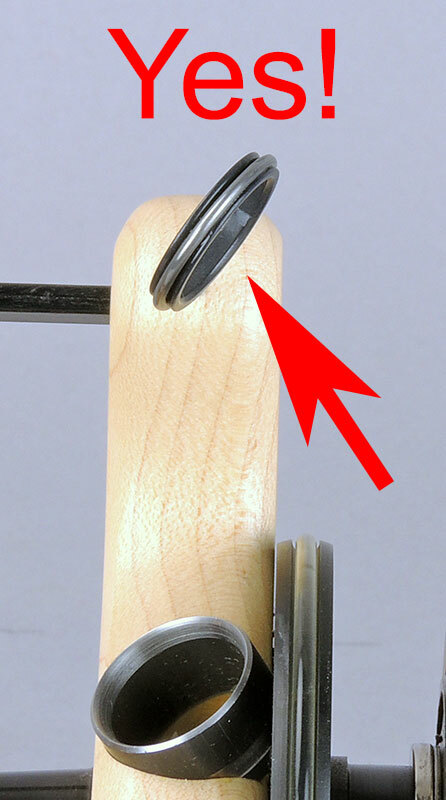 Correct the bobbin endplay by adjusting the latch at the rear of your miniSpinner. Noisy ball bearing. This sounds like a soft knocking or rattling, usually at higher speeds. Very uncommon. 5. WooLee Winder clacks or rattles: It probably needs service. There are many factors that can cause a WooLee Winder to make noise which are beyond the scope of this document. See our document, Spinning in Harmony With Your WooLee Winder, available at hansencrafts.com. Assembling the WW incorrectly after cleaning will also cause problems, so read the cleaning instructions carefully! If you continue to have problems, please contact HansenCrafts for help.